I was even more upset when I found out there used to be peanut butter Twix out there. I vaguely remember them being in red packaging. But I haven’t see any of those in a while, and it’s not for a lack of looking. Oh, life is so short. We have to seize the day while we still can. Which is why I decided to give Twix bars some long-delayed love. 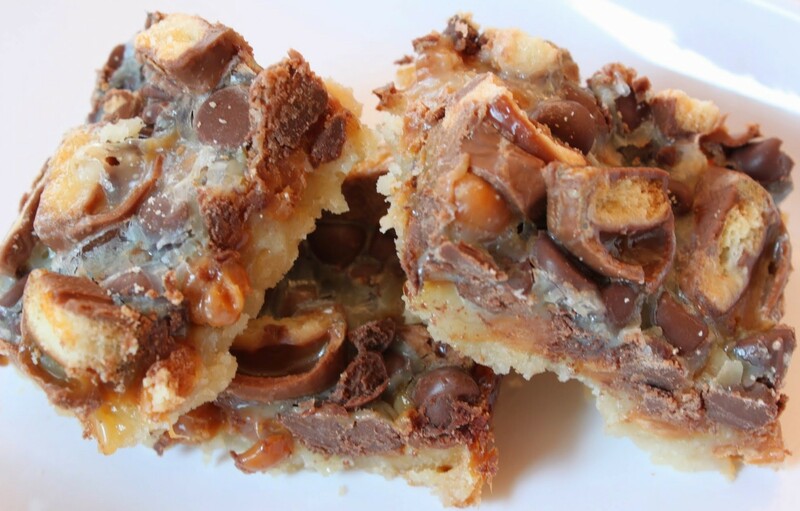 Magic bars are one of my favorite desserts. I inhale them with delight, vaguely aware that my blood sugar is shooting up past reasonable bounds, and then I stop caring and keep eating them. They’re just such a rewarding explosion of chewy and sweet. For these, I used refrigerated sugar cookie dough for the crust. I wanted a base that would be reminiscent of the cookie inside a Twix, and it paid off. 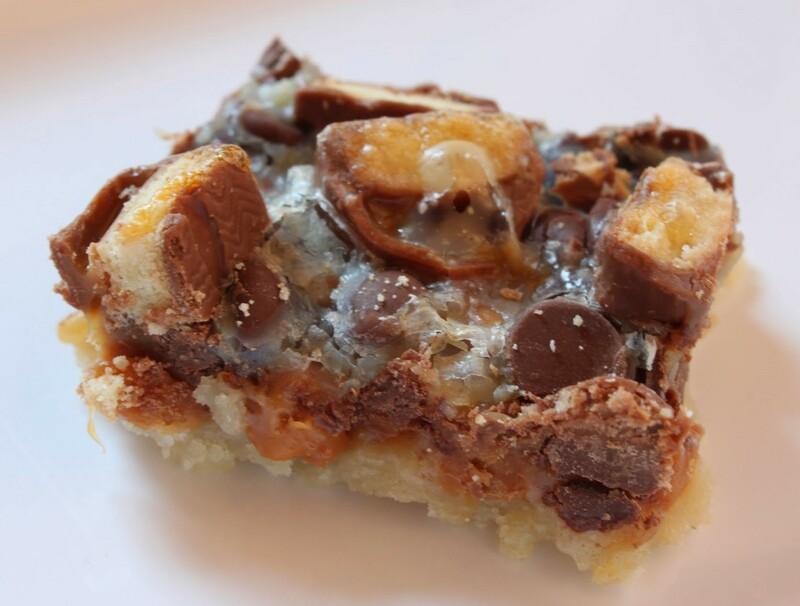 Then I added milk chocolate chips, those lovely little caramel bits that Kraft makes, and chopped up fun-size Twix bars. Voila! 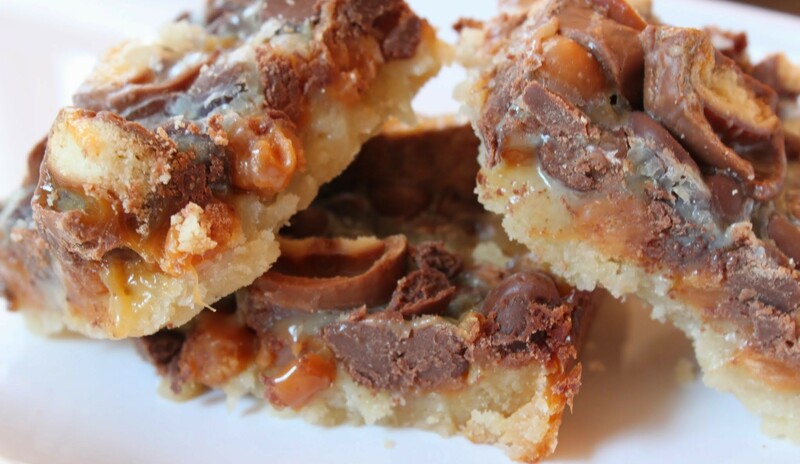 Twix madness. Woohoo! I gave these to some students, one of my most grateful test populations. They loved them and pronounced them, like, the best thing EVER. So if you put that into more perspective from being older, they’re pretty darn great. And so easy. Remember, I like easy. I have three kids and a full-time job. I need easy in my life! This is a two-second recipe. Well, not two seconds. But it won’t take you long. If you start making them after work, they’ll be done by dinnertime! Preheat the oven to 350. Line a 9 x 13 pan with foil, using enough to let the foil hang over the sides of the pan. Spray with cooking spray. Press the sugar cookie dough into the bottom of the pan. It will be sticky if it’s at room temperature, so don’t let it get too soft. Bake for 15 minutes until set and the edges are golden. 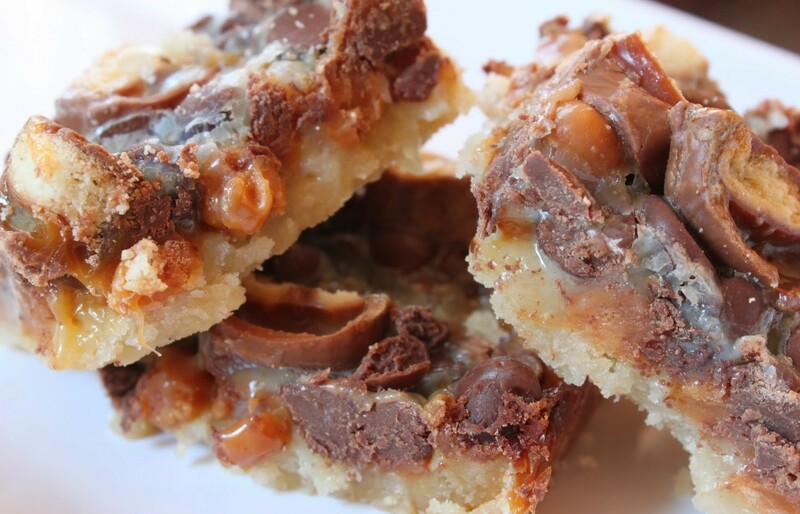 In the following order, sprinkle on the caramel bits, chocolate chips, and chopped Twix pieces, being sure to cover the surface evenly with all of the different elements. Drizzle the condensed milk over the top of the bars, covering the whole pan. 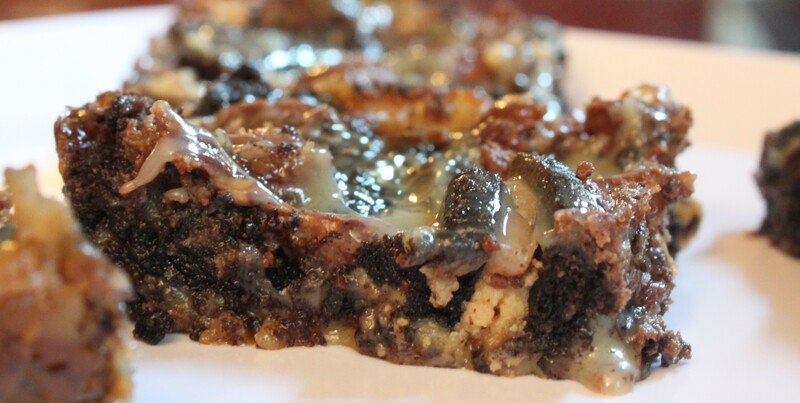 Bake the bars for 25-28 minutes until the edges are browned and the middle is fully cooked. Cut into small squares (they’re rich!) and serve or store in an airtight container for up to one week. Holidays have a way of sneaking up on a girl. July 4th, here you come! On my list of favorite low-maintenance holidays, July 4th is up there. I eat my annual nitrate-free hot dog (once a year is just enough, really), drink a cocktail, and whip up some brownies. It’s the perfect meal! I’ll never argue with a brownie in any form, but they’re at their best when giant chocolate chunks are nestled within. Oh, and when there’s a nice thick layer of glaze on top with sprinkles. 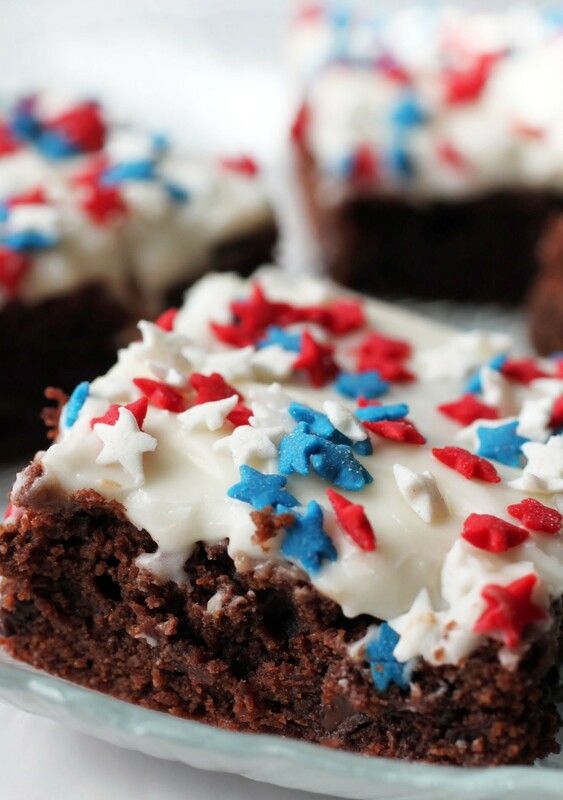 Patriotic sprinkle bling, no less! Everybody has a different idea of fun, which explains skydiving. I’ve never felt the urge. Yeah, I get that the adrenaline pumps because you think you’re about to bite it and then you don’t and woohoo and all that, but I can get my thrills a lot cheaper. Oh yeah, you challenge? You betcha. If I can find just ten minutes of uninterrupted reading time in my zoo of a household, that’s all the fun I can handle. Wait. Now I sound boring. So to change your mind about me real quick, here are these bars! They are the essence of fun. My middle daughter is quite a diva. At age four, she is already demanding in ways I never remember being. I was doing her hair the other day and she asked for me to do it “just like Elsa’s.” I swear to all the powers above, Frozen is doing me in. My hair is turning gray from that movie alone and how addicted my kids are to it. Anyway, no matter what I did to her hair, she continued to insist that it didn’t look right. I mean, duh. She has shoulder-length dirty blonde curly hair. Elsa has waist-length platinum flowy masses of Pantene commercial hair. But try explaining that to a preschooler. To say she threw a tantrum would be an understatement. She’s also been planning her fourth birthday party with way too much intricate detail. Have I mentioned she has two themes? Hello Kitty and (duh again) Frozen. Luckily, when it comes to party prep, I actually bake enough to satisfy her. 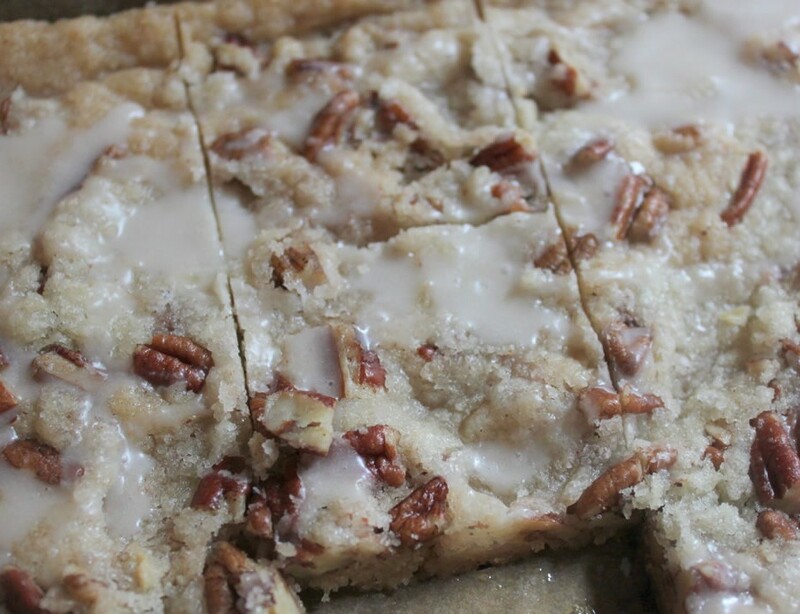 And these cinnamon crunch bars are all part of the pre-party baking binge! This is an awesome recipe! 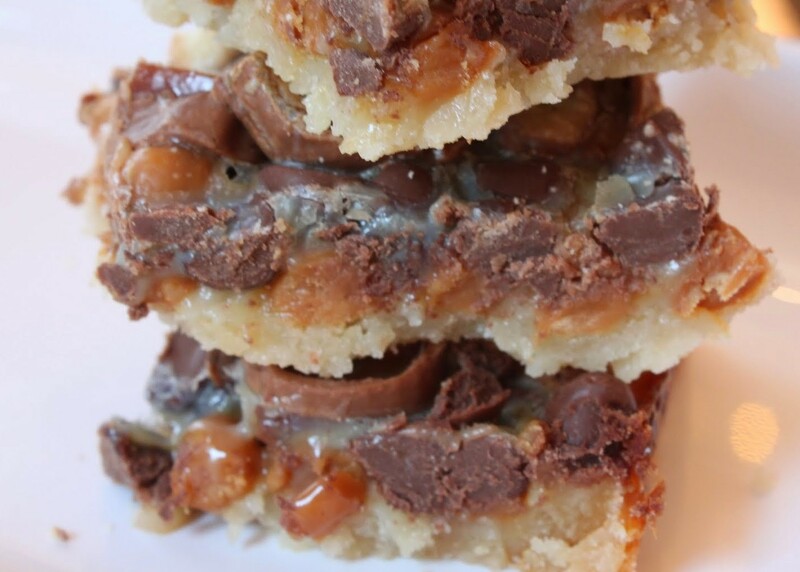 Twiz + magic bars = So good!